Hi there! It’s been a couple of months since my friends and I have shared our best renters hacks but Jess from Domicile 37, Linda from The Home I Create, and I are back with some more great tips for this fun series. We have focused on rental living rooms and rental bedroom decorating tips so this time we are giving you rental kitchen ideas. For an immediate large impact, add a vibrant pop of color or pattern to your rental kitchen walls or kitchen cabinets with renter friendly removable wallpaper. You can find our current kitchen rental makeover HERE featuring a fun herb garden print. Our last kitchen cabinets were transformed with Clara wallpaper from Walls Need Love. Who doesn’t love a floral kitchen cabinet? Crazy or genius? Don’t forget to update your hardware with different pulls! Make sure you store the original pulls somewhere so you can replace them when you leave if necessary. Read HERE to see how I changed dollar pulls to fit our eclectic style. I also have covered plain plastic cabinets with bamboo contact paper. It takes a little elbow grease to remove but the few hours of labor are definitely worth a kitchen you can enjoy! Add a modern twist to your backsplash with removable swiss crosses. This DIY only costs a couple of dollars and looks so fresh and modern. Since storage can be slim or awkward in a rental, try these tips and tricks for extra storage and organization. Utilize baskets and labels for easy access in your upper cabinets. Transform plain containers into beautiful counter storage like these Ikea glass containers with copper lids and chalkboard labels. And DIY spice and seasoning jars. The last tip is to mix in decor and interest to your kitchen. Add personality to glass cabinets or open shelving with paper and washi tape! Decorate your fridge with DIY dollar store plate magnets. Hang art in your kitchen. Anything from a cute pineapple print to a gorgeous oil painting will add instant appeal! 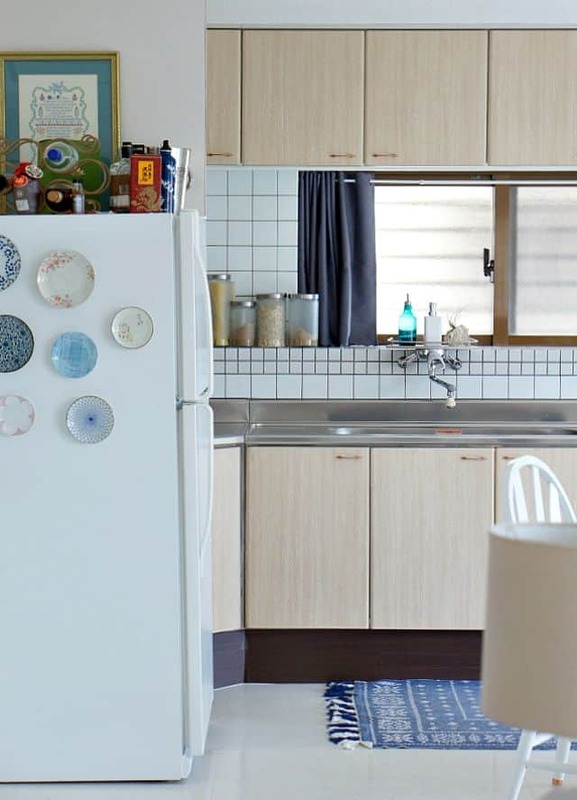 Don’t be afraid to makeover your kitchen furniture to fit into your rental kitchen. We scored a free table set that needed some love. See how I transformed it into an appropriate style for our kitchen with this tutorial. Let’s go see what my talented friends are sharing for their rental kitchen tips and tricks!